I’m hoping to resume my toddler activity series this fall. If nothing else because I need to find activities to occupy little Miss Cora during our school day. Cora is my most active toddler and I need a long list of activities to keep her out of trouble this year. I found this awesome idea on Pinterest (of course). This is truly a genius idea! You can find out how to make them on Toddler Approved! If your toddler throws them nothing will break. They are quiet when they fall. 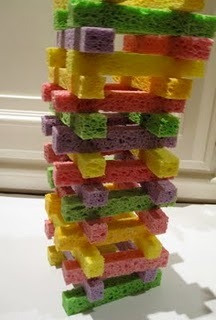 If your toddler is still putting everything in their mouth you might want to wait until they outgrow that phase before making these sponge blocks. They could choke on a piece of the sponge if they bit a piece off. I plan on making these for Cora this weekend! Love it! You had/will have a toddler series??? Will be following like a puppy. Sweet!! Gotta love Pinterest. This is fabulous. I will be making these sometime in the next year for my youngest. For now, he’s far too interested in chewing on everything. 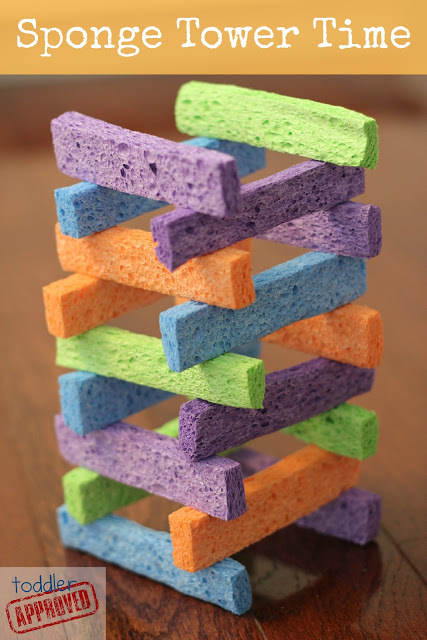 Toddlers definitely love to throw these… so be prepared for some sponge fights too.